[Firebase] Where should data be saved in firebase database? 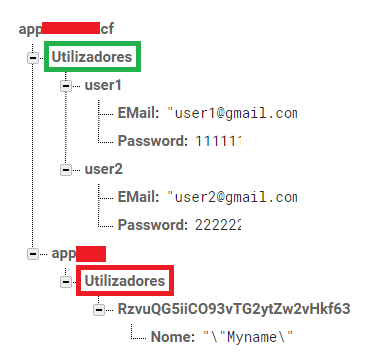 There is a “Utilizadores” (green) tag on the root of the database (that I added manually on the firebase database), and the blocks code added a new “Utilizadores” (red) inside an “app” tag! What is the best method to work? Inside the “Utilizadores” (green) tag on the root, or in the default “Utilizadores” (red) tag inside the “app” tag? And if the best method is on the root (green) how to set up the blocks to save it in the root (inside the “Utilizadores”)? This way the “Utilizadores” tag is now saved on the database root!